Another happy homeowner with MDHC | Custom Home Builders of the Hudson Valley, NY - Mid-Hudson Development Corp.
We could not be happier!!! Building our new home was an incredibly smooth and stress free experience. 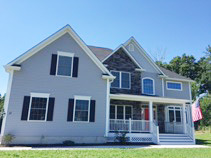 After searching for the right builder in the Hudson Valley area, we were fortunate to find Mid-Hudson Development. They were highly recommended by our realtor and have a great reputation for being excellent home builders. After meeting John Goetz and Christopher Sollecito we knew we were in the right place. They were so professional, knowledgeable, and personable. Their team of builders and subcontractors were making constant progress resulting in our house being built in a timely manner. Our house is now complete and we absolutely love it!!! The house was made to our specifications and we were involved throughout the entire construction of the house. John and Chris were always accessible to us and clearly explained each step of the construction process. They made us aware of any upgrades or additional options we could incorporate into the house but were never pushy or aggressive. We are so impressed and pleased with the level of craftsmanship and attention to detail MHDC uses in the building of their homes. Building a home with MHDC was one of the best decisions we have ever made! We are forever grateful to John and Chris for building our dream home. We could not be happier!! !